POLITICIANS IN THE Dáil who are landlords are able to make a distinction between their personal interests and the public interest, according to Taoiseach Leo Varadkar. Solidarity TD Paul Murphy suggested today that TDs who are landlords should abstain from a vote on an anti-eviction Bill which was debated in the Dáil this evening. He claimed that around one in four TDs in the Dáil are landlords. “At the every least does the Taoiseach agree that the one in four TDs here who are landlords should recuse themselves from voting on this Bill because of a clear conflict of interest? “That conflict of interest goes much deeper than their personal status as landlords. It is related to the commitment of the establishment parties to the capitalist system and the free market in housing which allows landlords to profit massively from a crisis facing tenants and others,” said Murphy. 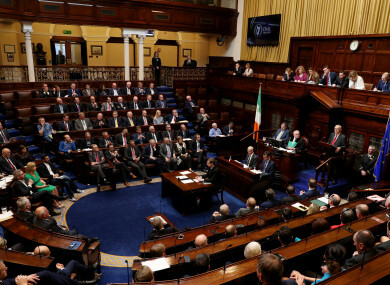 “I have no doubt that all Members of the House are able to make a distinction between their personal interests and the public interest and that applies as much to people who are members of trade unions who might vote on employment legislation, employers who might vote on employment legislation and all of us here who are taxpayers voting on tax legislation. Murphy’s calls were repeated by Solidarity-PBP TD Mick Barry during the debate this evening. He said that 15 Fianna Fáil TDs and 14 Fine Gael TDs are declared landlords, while four Cabinet ministers and five junior ministers are also landlords. The Members’ Interests list gives a glimpse into the financial affairs of our public representatives. Housing Minister Eoghan Murphy rejected that call for the TDs who are landlords not to be allowed vote. One the Bill’s provisions is a ban on renovation as a grounds for ending a lease. The Taoiseach said earlier that the anti-eviction Bill is “too extreme”. He said the Residential Tenancies Bill, approved by Cabinet this week, will deal with many of the pressures renters are facing. It has four provisions – the introduction of a rent register so that people can see what rents are being charged in the area in which they live, the extending the notice to quit period so that people who are asked to leave the house that they are renting get much more time to find a new place to rent. A legal definition of “substantial renovation” to end “renovictions” and bogus renovations is also included in the government Bill. The Residential Tenancies Board will also get additional powers to enforce the new laws. Email “Calls for TDs who are landlords to abstain from anti-eviction Bill vote due to conflict of interest”. Feedback on “Calls for TDs who are landlords to abstain from anti-eviction Bill vote due to conflict of interest”.